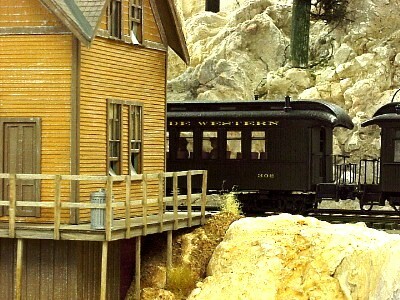 Here are some photos my Cimarron Summit Section House as it sits at the high point on the Cimarron and Tall Timbers main line. 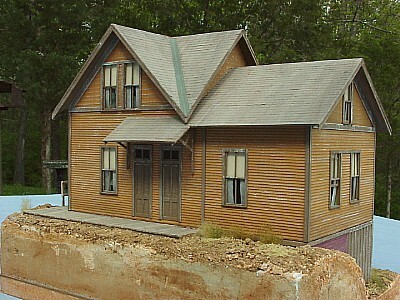 It was originally produced and sold as the Vance Junction Section House kit by Banta Modelworks. The structure is located across the tracks from the Cumbres style station at the summit. 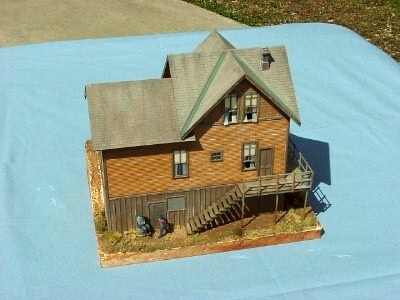 The kit was built in three major components: diorama type base, foundation and main building. 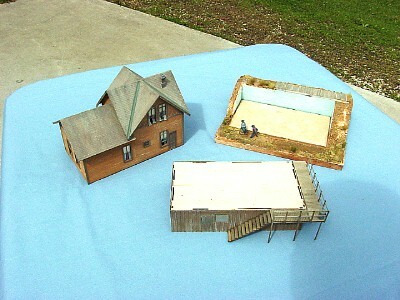 The structure was built as a mini-diorama on a piece of 1/2" Gator board, which had pieces of blueboard insulation foam glued on it to create the land forms. The foundation section is nestled against the foam and is held in place with a hidden internal floor piece. This eye level track side view shows the platform and some of the weeds and plants growing around the building. The platform was glued directly to the foam insulation and plaster was applied to, "work," it into position. The plants are fibers from an old piece of shag carpeting. Before they were assembled, all the doors and windows were painted a base color, then lightly dry brushed with white paint prior to being removed from their laser cut carrier sheets. Delta Ceramcoat and Folk Art liquid acrylic craft paints were used through out the project. 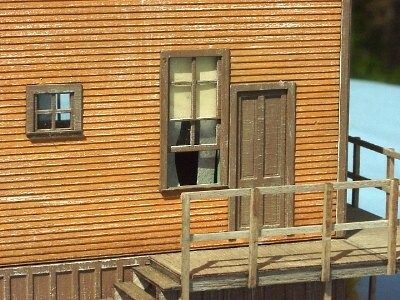 This pair of second floor windows features the open window effect I wanted. 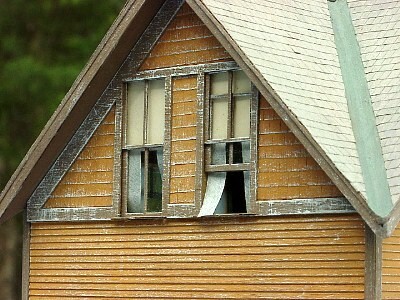 Several windows were assembled with the lower sash in an opened position. Curtains were made from high quality wrapping tissue and shades were cut from colored paper stock. This low angle view of the front door area shows the extra treatment of the corbels. I added a thin strip of wood to the mounting side of the corbels to make them easier to attach to the lap siding material. 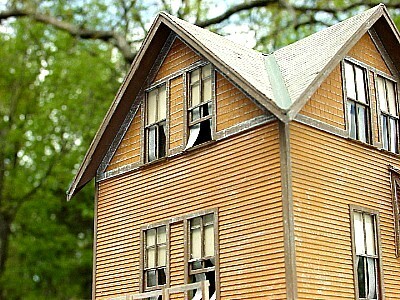 Unfortunately, when the building is situated on the layout, this front side will not be easily seen. Here's a shot of the left side of the structure showing the curtains blowing out the open windows. 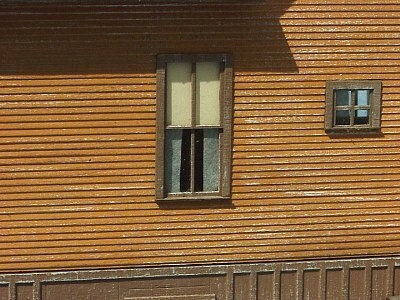 This is the view visitors will see when the building is on the layout. I've added a trash can to the rear deck and a wooden barrel near the basement door. 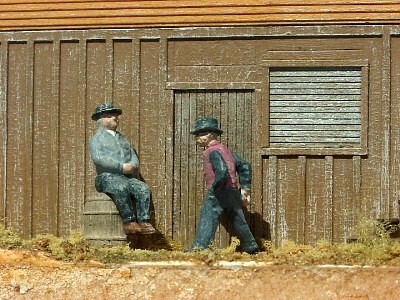 The barrel offers a great place for section gang members to rest and visit with one another. The ground cover is a mix of Colorado soil, Woodland Scenics ground foam and pieces of an old shag carpet. I, "flayed," the carpet fibers out with a small steel brush and poked the tuffs into holes that were punched in the Gator board. Everything was then secured with white glue. 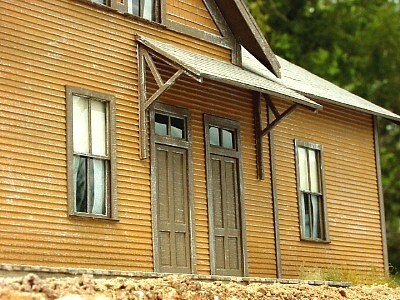 The building is now resting in place on the layout and a three car passenger train has pulled into the station across from the section house. Here's a wider view of the scene. 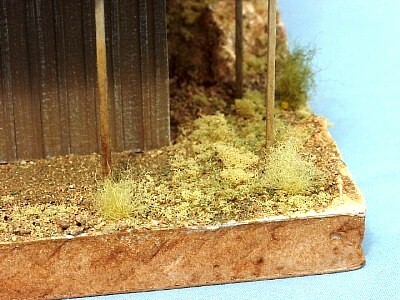 The dividing lines between the diorama and the fixed layout will be hidden better with additional weeds and landscaping materials.